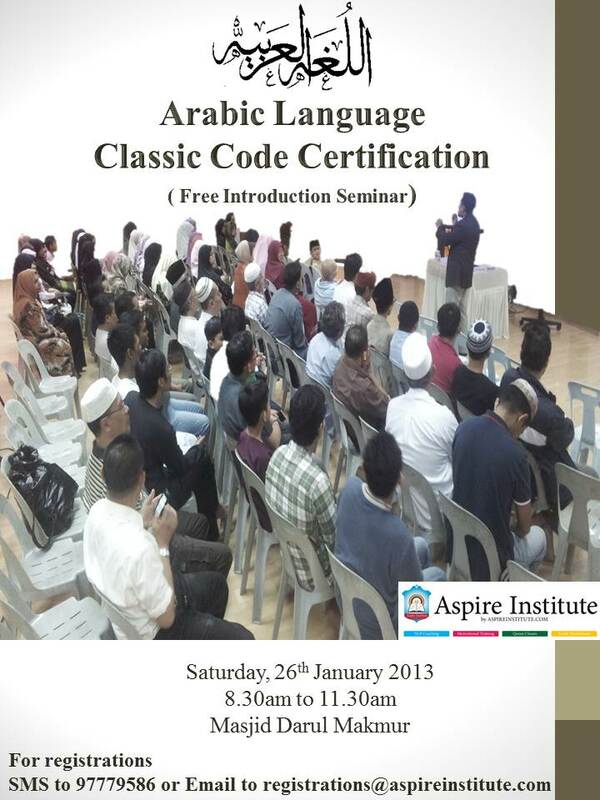 Arabic Language Classic Code Certification Program: Registration is Now Open! Safe & Secure - We respect your privacy! 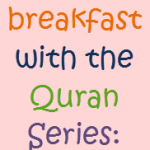 Breakfast with the Quran: "Growing Abudance In 2013: Planting Intention, Nurturing Motion "
Get The Early Bird Discounts! Arabic Language Classic Code is a MODULAR Certification Program launched during last Ramadan for Working Adults to understand the Language of the Noble Quran in 2-years. 1- Understand how you too can understand Arabic Language, Language of the Quran! 2- That Learning Arabic Language is Fun, Easy and Simple at Aspire Institute! 3- You will see the systems that make the learning fun, easy and simple! 4- Be introduced to our dedicated Trainers! 5- Understand the Curriculum and Syllabus and why it is structured that way! Please fill out the information below and email to registrations@aspireinstitute.com. A Twice Weekly Program of Arabic Language. By the end of year 2 participants will be able to understand the language of the Quran and able to acquire Infinite Inspirations and Motivations to lead a life of true success and fulfillment in this life and here after. More than 1400 years ago mankind was blessed with the Noble Quran. Since the time it was revealed through Our Prophet Muhammad s.a.w. the Quran not only completes our life with divine orders and commandments, but also make humanity whole with Infinite Inspirations and Motivations to lead a life of noble and fulfillment. The History of Previous Andalus and Baghdad is a testimony to this fact. Sadly though, when Arabic Language lost its grasp as the spoken language of the world, Muslims have since lost the sight the Quran’s true beauty which lies in understanding its meanings in its native form; Language of the Quran. 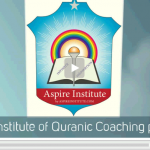 With the aim to understand the language of the Quran and unfold its Infinite Inspirations and Motivations in it’s native language, Aspire Institute of Quranic Coaching is honored to offer Arabic Language Classic Code Certification, a certification which leads to the understanding of the Quran in its native language. The certification is a 3-level, twice weekly, modular program with the intent of understanding the language of the Quran. The entire 12-Module Curriculum is synthesized using proven Classical Method and linguistic approaches of Communication and High Frequency Words. By the end of the 2-year program participants will be able to understand the Noble Quran in its native language and able acquire Infinite number of Inspirations and Motivations from the Book of Guidance, to lead a life of true success and fulfillment in this life and hereafter. Spread the Word - Like and/or share this page, your friends will also love it and thanks for it. 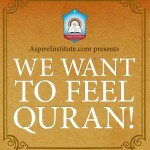 WE WANT TO FEEL QURAN!